When we stop over in Singapore on our way to London one of the places we will be visiting is the Cavenagh Bridge, named in honour of my 3rd great uncle Orfeur Cavenagh (1820 – 1891), Governor of the Straits Settlements from 1859 to 1867. Orfeur Cavenagh was the fourth of eight children of James Cavenagh (1766 – 1844) and Ann Cavenagh nee Coates (1788 – 1846). James Cavenagh was a Royal Staff Corps surgeon. He was at the Battle of Waterloo in 1815. Orfeur Cavenagh trained at Addiscombe, the East India Company Military Seminary in Surrey near London, and passed his exams in 1837. He served in India and was wounded severely twice. Between 1850 and 1860 Singapore’s population grew from 60,000 to 90,000. The first thorough census of Singapore was taken in 1871 and the population was 97,111. Singapore had grown rapidly in the decade before Orfeur Cavenagh’s arrival but the population increase was more restrained in the period of his governorship. In June 2017 Singapore’s population was 5.4 million, sixty times the population of 150 years earlier. Singapore has continued to prosper in the last 150 years: Singapore’s economy is very strong and Singapore is ranked third in the world by gross domestic product (at purchasing power parity) per capita. Cavenagh is remembered as a hardworking Governor and apparently, in general, the verdict of modern historians on Cavenagh’s performance is favourable. However, in 1862 he embarrassed Anglo-Siamese relations with an un-authorised bombardment of Kuala Trengganu. It was possibly this incident which meant his career languished after the Governorship. On 3 July 1891 he died in Surrey, England, aged 70. Governor of the Straits Settlements (1859 – 1867) under the Government of British India. A plaque at each end of the bridge includes the Cavenagh coat of arms and the inscription honouring Orfeur Cavenagh. The wheatsheaf [heraldic garb] is the standard crest of the Cavenaghs. The left hand side of the shield is the generic Cavenagh arms, probably in red [gules] on white/silver [argent]. My grandmother Kathleen brought a small dish back from Ireland with the Cavenagh arms on it. This shows two crescents but our family uses three; for example, the arms used by Matthew Cavenagh (1740 – 1819) were “Azure, a lion passant argent, armed and langued gules, between three crescents of the second.” Matthew Cavenagh was the grandfather of Orfeur (and my fourth great grandfather). The left hand side of a shield is the more important/honoured/valuable – because it is the right hand side of the person wearing/carrying it. That the Cavenagh arms appear on that side makes sense. The right hand side of this shield is a chevron with three “covered cups” (goblets with lids). I was puzzled by how this connected to Orfeur Cavenagh. 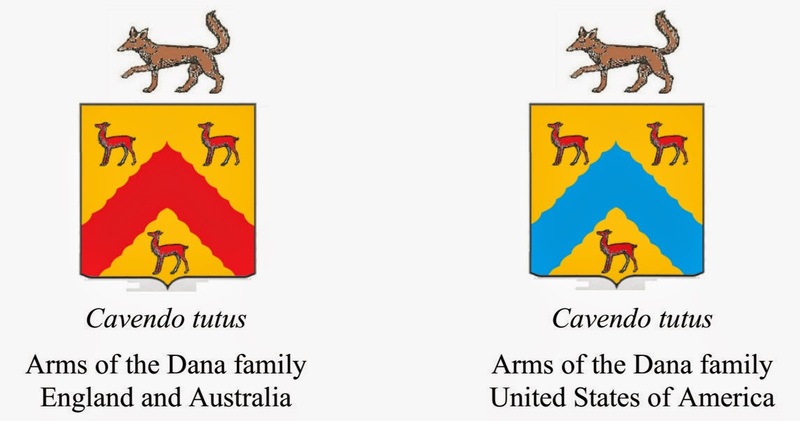 With the help of some cousins I have learned that these arms are associated with the Odiarne family. Orfeur Cavenagh’s mother, Anne Cavenagh nee Coates, was the great great grand daughter of Thomas Odiarne (1639 – 1704). Both her father and grandfather were named Odiarne Coates. The Odiarne arms appeared as one of the 856 shields on the ceiling of the cloisters of Canterbury Cathedral, but it appears they may not have survived to be among the shields there today. 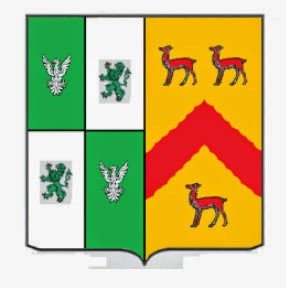 Orfeur Cavenagh’s father, James Gordon Cavenagh, used these arms for his bookplate, and Orfeur Cavenagh seems to have adopted his father’s design. Neither of them registered the arms with the College of Arms. GULLICK, JOHN. “THE CAVENAGH PAPERS.” Journal of the Malaysian Branch of the Royal Asiatic Society, vol. 75, no. 2 (283), 2002, pp. 51–64. JSTOR, http://www.jstor.org/stable/41493473. One of my 12th-great-grandmothers was Anne Bray nee Vaux (1550 – 1619), daughter of Thomas Vaux (1509–1556) and Elizabeth Vaux nee Cheney (1505 – 1556). In 1556, when she was about six, Anne’s parents died: Thomas in October and Elizabeth in the following month, possibly from the plague. Her brother William was then 21, and sister Maud about 17. … a household of almost fifty people that included grooms, laundresses, the cook, the baker, an embroiderer, the chaplain and the steward. An account book survives for the year of [the birth of Anne’s brother William in 1535 showing] payments for a birdcage, soap, swaddling and, on 14 August, five shillings to buy ale for the nurse. After her parents died Anne would have been placed in another household. About 1568 Anne Vaux married Reginald (or Reynold) Bray (1539 – 1583), the fifth and youngest son of Reginald Bray and Anne, daughter and heiress of Richard Monington of Barrington in Gloucester. Three of Reginald’s older brothers died without issue. His brother Edmund inherited the estate of Barrington; the estate at Steyne (Stean) and Hinton in Northamptonshire was settled on Reginald. Reginald, aged about 44, died in October 1583 and was buried at Hinton in the Hedges. Mary, born about 1569. On 16 August 1586 at Eaton Bray, Bedfordshire, she married Sir William Sandys (c 1562 – 1641) of Fladbury, Worcestershire. She appears to have died by 1597 about the time of his second marriage, to Margaret Culpepper. She appears not to have had children. Anne, born about 1573; she was later the wife of John Sotherton (1562 – 1631), a judge and later a Baron of the Exchequer. John Sotherton married two more times and had two sons and a number of daughters. Anne was possibly the mother of one or more of these children. Anne had died by 1602..
Alice, born about 1577. In 1592 she married Nicholas Eveleigh, a lawyer. Nicholas Eveleigh died aged 56 in 1618 when the Chagford Stannary Courthouse collapsed killing him, two of his clerks and seven others, also leaving a further 17 injured. She secondly married Elize (Ellis) Hele, a lawyer and philanthropist who died in 1635. The trust from his will was used to found a number of schools including Pympton Grammar School. Alice died on 20 June 1635, probably childless. She and her second husband are buried at Exeter Cathedral. There is a monument to both of her husbands at Bovey Tracey Church. Temperance, born about 1580. She married Thomas Crew, a politician. Margery, born about 1581. She married Francis Ingoldsby of Boughton and they had a son John. The Vaux family of Harrowden were a notable Catholic family. Anne’s brother William, 3rd Baron Vaux of Harrowden ( 1535 – 1595), was several times convicted of recusancy during the reign of Elizabeth I. He was committed to the Fleet Prison by the Privy Council, and afterwards was tried in the Star Chamber on 15 February 1581 along with his brother-in-law Sir Thomas Tresham for harbouring the Jesuit Edmund Campion and contempt of court. He was sentenced to imprisonment in the Fleet and a fine of £1,000 (about £263,000 as of 2018). Anne and her sister Maud however appear to have married Protestants. Maud (abt 1539 – abt 1581) married Anthony Burgh / Burroughs / Burrows of Burrow on the Hill, Leicestershire. Following Maud’s death, her daughter Frances (abt 1576 – 1637) went to live with her cousin, Eleanor Brooksby nee Vaux, the widowed daughter of Maud’s brother William. Eleanor raised Frances as a Catholic. In about 1595 Frances joined the Canonesses Regular of the Lateran at Louvain in Belgium. According to one history of these Lateran Canonesses, as a child Frances was taken to with her family to attend ‘heretical’ (Protestant) services on Sundays and holy days, but during them regularly fell asleep, a sure sign of her firm commitment to Catholic orthodoxy. That Anne Bray nee Vaux named one of her daughters Temperance is clearly a mark of her Protestant Puritan leanings. Thomas Crew, Temperance’s husband, was noted for his strong Puritan convictions. YEARES : AND THEY BOTH ARE NOW AT REST IN THE LORD. Jessie Childs (2014). God’s Traitors: Terror and Faith in Elizabethan England. Oxford University Press. pp. 11 – 12; pp 182- 183. John Burke (1836). A Genealogical and Heraldic History of the Commoners of Great Britain and Ireland Enjoying Territorial Possessions Or High Official Rank: But Uninvested with Heritable Honours. Colburn. p. 244. Family tree of Reginald Bray retrieved from Baker, George. “History and Antiquities of the County of Northampton.” 1822, page 685 retrieved electronically through Archive.org archive.org/stream/HistoryAndAntiquitiesOfTheCountyOfNorthamptonBakerVol1/History%20and%20Antiquities%20of%20the%20County%20of%20Northampton%20-%20Baker%20Vol%201#page/n687/mode/2up. Also page 637. CREWE, Thomas (1566-1634), of Gray’s Inn, London and Steane, Northants. ; later of Serjeants’ Inn, Fleet Street, London. The Dana family is noted in American history, and has members and kinfolk around the world. The coat of arms, however, potentially an insignia of identity and relationship, has been a source of confusion; enhanced by contradictory and essentially spurious accounts of the family origin. One, ascribed to Richard Dana (1700-1772) and based on the frame of his portrait, has a silver shield with a blue chevron engrailed [see below] between three “stags:” these last, however, will be discussed further. The crest is a fox and the motto Cavendo tutus. The second, based on the bookplate of Richard’s son Francis Dana (1743-1811), is described with a red chevron rather than a blue one, again with the crest of a fox and the motto Cavendo tutus.3 A note adds that Francis’ son Richard Henry Dana Senior (1787-1879) had a gold shield, and unicorns instead of stags. A third, based on the bookplate of Charles L Dana, has “On a bend [see below] three chevrons [or chevronels];” no colours are specified. The crest is described as an ox’s head cabossed (facing the viewer); no motto is given. There were several men named Charles Dana with the middle initial L, but this one is probably Charles Loomis Dana (1852-1935), a noted physician. And the fourth, from the bookplate of Charles A Dana, has a shield divided horizontally into six bars, with three lions rampant [see below] wearing crowns; again, no colours are specified. Here too the crest is an ox’s head, and there is no motto. Again, there have been many Charles Danas with the middle initial A, but this one is probably Charles Anderson Dana (1881-1975), lawyer, businessman and philanthropist; another Charles Anderson Dana (1819-1897) was a well-known journalist associated with General Ulysses S Grant during the American Civil War, but the lawyer appears more likely to have used a coat of arms. All these variants are discussed further below, and I argue that Bolton’s is incorrect in a number of details, but the two used by Richard and his son Francis are the earliest recorded and appear the most significant. “Arms and Badges” at http://www.armsandbadges.com/browse.aspx?List=3f80a37c-4a73-4b95-bd3c-e7a36871d7a4; accessed May 2014. This shows a white/silver shield with a red chevron and three stags, similar to Bolton’s description of that used by Francis Dana above. There is an eagle’s head above the shield, looking like a crest, but Arms and Badges applies the eagle’s head to all its presentations; it is not specific to any family. “Heraldry WS” at http://www.heraldry.ws/html/dana.html; accessed May 2014. This is the shield which Bolton’s ascribes to Charles L Dana above, with the colours shown as a black shield, a white bend and green chevrons. “House of Names,” which is associated with “The Red Thread,” presents two versions at http://the-red-thread.net/genealogy/dana.html; accessed May 2014. An “English” version has a gold shield, with a red-and-white checked chevron between three silver trefoils – similar to shamrocks, as below; this is heraldically incorrect, for silver should not be placed upon gold. An “Italian” version has vertical bars of gold and blue. “4crests” at http://www.4crests.com/dana-coat-of-arms.html; accessed May 2014. This design is similar to the English version of House of Names, but the trefoils are green, which is heraldically acceptable. In fact, the origins of the Dana family are quite obscure, and their heraldry is erratic. By the use of library resources, however, including material which has been placed on the internet, and various items of physical evidence, it is possible to trace some history and to recreate the earliest coat of arms. In her Introduction to The Dana Family, Elizabeth Ellery Dana discusses the possible origins of the family, and concludes that the only likely connection is with Manchester in England, where a Richard Dana was baptised on 31 October 1617. His name is not mentioned again in English records, and it is probable this is the same person as first appears at Cambridge, Massachusetts, in the early 1640s. Elizabeth Ellery notes that she has explored the possibility of a French origin, including any connection to the Huguenot exile community in England, but can find no references; and she dismisses the theory of migration from Italy. Amongst other arguments against a non-English origin, Richard Dana held substantial official positions in Massachusetts, and it is most unlikely that a foreigner would have received such appointments in a British colony. The Dana Family notes also that Richard Dana was the only person of that surname to come to America for the next two hundred years, and he is the sole ancestor of the main family. About 1647 Richard Dana was awarded a land grant on the southern bank of the Charles River. He continued to acquire property, he was an early donor to Harvard College, and he held several important local offices. He died of a fall in 1690. Richard’s son Francis (1743-1811) had a still more impressive career, on a national scale. A leading lawyer and a close associate of George Washington, he was a member of the Constitutional Congresses of 1777, signed the Articles of Confederation in 1778, and was sent as Ambassador to Russia in 1780; the future President John Adams served as his secretary. Again a member of Congress in 1784 and a leader of the Federalist Party, he later joined the Supreme Court of Massachusetts, and was Chief Justice from 1791 to 1806. His son and grandson, Richard Henry Sr and Jr, were both lawyers; Richard Henry Sr (1787- 1879) being also a well-known poet and literary critic, while Richard Henry Jr (1815-1882) was the author of Two Years Before the Mast. Francis Dana was the third son of Richard: the eldest, Edmund, was born in 1739; a second son, Henry, was born in 1741 but died in 1761. Edmund had graduated from Harvard in 1759, and he left America for England about 1760; it does not appear that he ever returned. Edmund took holy orders in the Church of England, spent time in London, and then held a series of livings, ending as Vicar of Wroxeter in Shropshire. It was not a notable career, in no way comparable to that of his brother Francis, but he did become well connected: in 1765 he married Helen, daughter of Charles the sixth Baron Kinnaird; her mother Barbara was a daughter of the baronet Sir James Johnstone.10 It was probably through Edmund’s agency that the Dana family first acquired a coat of arms, though it came by a most roundabout route and is of very uncertain authority. In 1569, during the reign of Queen Elizabeth I, the Alderman William Dane of London became Sheriff of that city and was granted a coat of arms by the English College of Heralds. Originally from Stortford in Hertfordshire, he became a member of the Worshipful Company of Ironmongers and was Master of the Company in 1570 and in 1573, in which year he died. So William Dane adapted the shield of his Company but created several points of difference, reversing the colours and even varying the edge of the chevron. It is important to note, however, that the animals on his shield were hinds – female deer – and not stags. The badge of Sir Christopher Hatton (1540-1591), future Lord Chancellor and already a favourite of Queen Elizabeth, was a hind, and it is probable that William Dane was showing respect to a current or potential patron. In similar fashion, when Sir Francis Drake sailed around the world from 1577 to 1580 he named his ship Golden Hind. William Dane was survived by his wife Margaret nee Kempe, but the couple had only one son, who died young, probably before his father, so there was no-one to inherit the coat of arms. The person responsible for the appropriation was most probably the Reverend Edmund Dana. There is no way to tell how he found out about the grant of arms in 1569, but after his arrival in England in the early 1760s he would have had opportunity to make enquiries, and he may have simply asked at the College of Heralds when he was in London. One particular reason for Edmund Dana to seek a form of arms would be his marriage to Helen Kinnaird in 1765. Regardless of personal affection, as the daughter of a lord she and her family could expect her to marry a gentleman of coat armour, and Edmund might well have found it desirable to acquire such insignia; since we are told that the couple were wed at Leith in Scotland, where heraldry is governed by Lord Lyon King at Arms independent of the English establishment, there were probably no questions asked. This being done – and we know that Edmund Dana’s family in England used a version of the shield of William Dane14 – it is not difficult to accept that he advised his father and his brother Francis of the newly-claimed arms. Their use was never registered by the English College of Heralds and so was formally unlawful in that country, and few American colonists had been granted arms. Edmund Dana was evidently not concerned, however, and his father Richard and brother Francis were certainly not deterred; they appear to have been making use of the insignia by the mid-1760s. We have noted that Richard Dana had his portrait painted by John Singleton Copley in 1765. The portrait survives and is presented within a gilded frame, probably of the same date or very close to it, which has at the top a shield and a crest. The picture and frame are privately owned by a member of the family, but it was lent for an exhibition at the Metropolitan Museum of Art in New York during 1992, and a descriptive catalogue was published as American Rococo, 1750-1775: Elegance in Ornament.15 Unfortunately, though there is a large photograph of the portrait and its ornate frame, the design at the top does not come out well and cannot be reproduced here. The charges can nonetheless be identified as a blue chevron and three animals, and the crest is a walking fox. In contradiction to the entry in Bolton’s Armory, however, it is clear that the background of the shield is gold. It is not possible to ascertain whether there is a motto. About the same time Richard Dana’s son Francis had a bookplate prepared, also showing a coat of arms. The work was engraved by the distinguished silversmith Nathaniel Hurd, and a copy appears facing page 30 of The Dana Saga. This contains the full achievement, and the illustration has a commentary by the author Henry Dana, including a blazon [description] of the whole achievement: “Argent, a chevron engrailed azure, between three stags trippant gules.” The crest is a fox, and the motto is Cavendo tutus: Safe [tutus] by being cautious [cavendo]. Firstly, though engraved metal can have no direct colouring, colour can be indicated by a system of “hatching:” whereas argent or silver is plain, dots are used to show or, the heraldic term for gold, Downward lines indicate gules red, sideways show azure blue, and the lines for vert green are diagonal from top left to bottom right. In the illustration, therefore, dots are discernable on the background of the shield, and so it should in fact be described as or gold, not as argent silver; that is the way William Dana had it in 1569. Second, while the chevron is indeed engrailed, the hatching is unclear. It is possible that the chevron is red rather than blue, a variation from William Dana’s, but more probable that Francis followed the some blue colour scheme as on the frame of his father’s portraits. Thirdly, however, though the blazon given by Henry Dana describes the animals as stags, they do not appear to have horns, and are more likely to be the original hinds of William Dana. In that regard, the design proposed by Arms and Badges above, with deer surrounding a red chevron, is comparatively close, but the animals are female without horns, not stags with antlers, and the background of the shield is gold and not silver. Bolton’s American Armory, as discussed in the Introduction, says that Francis Dana’s son Richard Henry Sr had a bookplate with a gold shield but with unicorns instead of deer. I suspect this is a misreading of the design, and that in fact the animals were correctly hinds. We may note also that, writing in the 1860s, J J Dana states at page 6 of his Memoranda that “The first known proofs of [the shield’s use are soon after the Revolutionary War.” The evidence of Richard Dana’s portrait frame and the bookplate of Francis Dana would indicate that he is mistaken. In general, while shields are supposed to be more or less permanently attached to a particular family, subject to slight variations to identify individuals or cadet branches, crests can be changed more readily and mottos can be adopted almost at will. Most families, however, maintain the same tradition from one generation to the next. The motto adopted by Richard and Francis is shared with other families, sometimes accompanied by the crest or charge of a snake, though it is also used by the Dukes of Devonshire, whose surname is Cavendish which goes quite well with cavendo. For the Danas, though the crest of the fox has no earlier authority, it makes a nice combination with the motto: female deer should be careful when there are foxes about. When I was in Cambridge, Massachusetts, during September 1999, my aunt Nancy Movius nee Champion de Crespigny showed me a small camphorwood box with a silver plaque engraved with a shield and a motto. The box is a family heirloom which has since been passed to Nancy Movius’ grand-daughter, but at that time its provenance was not known, and she asked me to try to find out what the shield related to and where the box might have come from. I was able to offer her some conclusions, which I have now been able to confirm. dexter: quarterly, 1 and 4, vert an eagle displayed; 2 and 3, argent a lion rampant; sinister: or, a chevron engrailed gules between three hinds. Translated from the formal language, we have a shield divided in two down the middle. 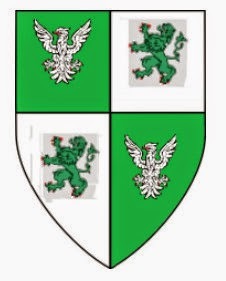 The left-hand part of the shield is again divided into four parts, of which both the top left and bottom right have a green background with a spread-winged eagle; while the top right and bottom left have a white or silver background with a lion rampant. From the discussion above, we know that the right-hand half is a version of the Dana shield, based upon that of William Dane, but with one significant difference both from William Dane’s shield and from that used by Richard and Francis Dana in America: whereas the background is or gold, and the three animals are female deer, the chevron is engraved with vertical hatching, indicating gules red. It appears that Edmund Dana in England varied William Dane’s shield, but his father and his brother preferred to keep the original colours. The reference to the Tower is unusual: most families are described as coming from a particular county and not from a building, even a royal one. Shaw’s Knights of England, however, records that Edward Sherburne, clerk of Ordnance at the Tower, was created a knight bachelor in January 1682 (the beginning of 1683 by modern calculation – New Year at that time was in March).18 These are presumably the arms that he bore and that his descendants continued to hold, though they may have had no further connection to the Tower. A shield divided into two relates to a married man whose wife has brothers. When a woman marries, her husband is entitled to “impale” the arms of his father-in-law. If, however, the wife has no brothers, she is a “heraldic heiress:” her husband places her family arms on a small shield in the middle of his own, and their descendants can show the combined arms as “quarterings” thereafter. So the small shield engraved on the box relates to a married couple, the husband being a man of the Sherborne surname and the wife being born Dana. Fortunately it is comparatively easy to identify them. The genealogy in The Dana Family lists the children of the Reverend Edmund Dana.20 The first three were daughters: Frances Johnstone, who was born on 8 May 1766 and died on 7 May 1767; Elizabeth Caroline (1767-1844) who had many children; and Frances Johnstone, born on 3 September 1768 and named after her dead sister – a common custom of the time.21 In 1793 this second Frances Johnstone Dana married Joseph Sherburne [or Sherborne], and the union was symbolised by the shield which combined their families’ arms. Charlotte Frances Champion Crespigny nee Dana was eighth child of William Pulteney Dana (1776-1861), who was born at Wroxeter as the seventh child and second son of the Reverend Edmund Dana. Frances Johnstone Sherborne nee Dana, William Pulteney’s elder sister, was the aunt of Charlotte Frances and also her godmother. In order for the box to come into the possession of my aunt Nancy Movius, daughter of Constantine Trent Champion de Crespigny, it must have been owned by her great- grandmother Charlotte Frances nee Dana, who came to Australia with her husband Philip Robert Champion Crespigny in 1852. Like the Bible, it was presumably a gift, and the date when it was given may be indicated by the motto on the plaque: “In God Alone I Trust.” The motto is not associated with either the Sherborne or the Dana families,22 but it would be most suitable for a present from a godmother, and I believe the box may have been given to the infant Charlotte Frances at the time of her christening in 1820. So the shield of the Dana family in England and Australia, descended from the Reverend Edmund, was gold with a red chevron and three red hinds, while the family in America, descended from Edmund’s father Richard and his younger brother Francis, followed the original sixteenth-century pattern borne by William Dane, with a blue chevron. It is probable that both sides of the family used the crest of a fox and the motto Cavendo tutus. In footnote 57 on page 29 of The Dana Saga, Henry Dana remarks that Elizabeth Ellery Dana disapproved of any claim to heraldic honours: “the Dana family, with their humble origin, had no right to bear this Coat-of-Arms.” Henry supports her opinion, and particularly objects to the fox crest and to the motto: “The Danas were rarely safe and never cautious.” Richard, Francis and their kinfolk, however, were and are entitled to disagree. We have noted in the Introduction above that Bolton’s American Armory lists two other sets of arms used by members of the Dana family, both based on bookplates: Charles L[oomis] Dana had a shield with a bend bearing three chevrons; no colours are given, but the footnote to page 29 of The Dana Saga describes the shield as black, with a white bend and three green chevrons: this is the same as that presented by the website of Heraldry WS. Charles A[nderson] Dana had a shield divided horizontally with six bars, with three lions rampant wearing crowns, but there is no source for any of the colours; presumably the bookplate did not provide any hatchings. I have provided random colouring in order to show the nature of the background and the charges. In his footnote to page 29 of The Dana Saga, following his unfavourable view of the arms claimed by Richard and Francis Dana, Henry Wadsworth Longfellow Dana remarks that the black shield with a white bend and three green chevrons, accompanied by the crest of a bull’s head crest “is, if possible, even more spurious.” He makes no comment about the shield with bars and three crowned lions rampant, but would no doubt have been even more scathing. and Charles Anderson Dana was descended from Benjamin (1659/60-1738), sixth son of the first Richard. By the early twentieth century, therefore, when Charles Loomis Dana (1852-1935) and Charles Anderson Dana (1881-1975) were making use of their bookplates, the connection was very distant. Strictly speaking, they should perhaps have used some variant of the earlier coat of arms, but given the distance of the relationship and the lapse of time it was reasonable for them to have chosen insignia of their own, and their descendants are free to follow their models. Finally, we may note once more that while Bolton’s American Armory lists shields and arms for the Dana family, neither Papworth’s Ordinary nor Burke’s Encyclopaedia record any of the forms. Those latter compilations deal only with the heraldry of Britain, where the lineage of William Dane was long extinct; though members of the Dana family made use of his chevron and hinds in England and elsewhere, they never sought to register them. There are three sets of arms which can be ascribed to one branch or another of the Dana family. Those connected to Charles Anderson Dana, in the line of Benjamin the sixth son of the found Richard Dana, may like to use the shield with six bars and three crowned lions – and may presumably choose whichever combination of colours seems appropriate. 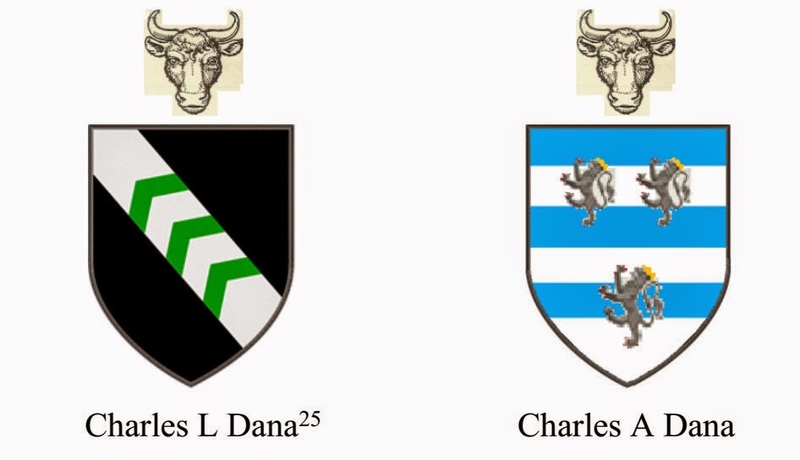 For those related to Charles Loomis Dana, descended from Caleb son of Daniel and grandson of the first Richard, there is his black shield with a white bend and three green chevrons. And those of the second Richard’s lineage can claim the tradition of a chevron on a gold shield, with three red hinds or does; the colour of the chevron may vary between blue, for members of the family in the United States, to red for those of English or Australian background. So there is a broad choice, and individuals may vary colours and shapes to distinguish themselves from their cousins. One notable point, however, is that of the designs found on internet websites, only that shown by Heraldry WS has actually been used by a noted member of the family. The version provided by Arms and Badges has some relation to the initial accession by Richard, Edmund and Francis Dana, taken from the shield of William Dane, but is mistaken as to colour and has stags rather than hinds. All others must be regarded as fictitious and without authority.